The math part of making a small element can be interesting. In this case I wanted to make a 700 watt element (120 volts x 5.84 amps = 700 watts) which is a 20.5 ohm element. If I used 16 gauge wire which has about 0.335 ohms/foot the element would contain about 61 feet of wire and weigh about a half a pound so there would be no place to put this inside a 120 cubic inch space. But if I used 22 gauge wire it would only need 15 feet of wire (at 1.367 ohms/foot). This 15 feet of 22 gauge wire wraps up nicely on a 3/16 inch arbor to make a closed coil 6.25 inches long. If stretched over a 20 inch distance we would have 12.33 coils per inch stretch for a wire that is 0.025 inches in diameter, that's pretty good. This unit was built in 1993 and served as a cane heater and hot parts storage (like an Italian Garage) when we did our bead production. By preheating the glass canes they could go directly into the flame which greatly sped up the production mode of things. We have two of these and both were used for a twelve year period during which time neither required an element replacement. These units were first built in 1993. We sold this model to other beadmakers and for a number of years it was a popular item in our production line. The kiln element, an E120-6.25-205 (750 Watts), is supported on a pair of 15" long mulite rods. This element has held up remarkably well as I have only replaced three or four elements in all of the 75 or so kilns made then and most are still functioning. This kiln heats from room temperature to annealing 950 deg. F. in 12 minutes with a top temperature of 1150 deg. F. which is achieved at about 25 minutes. 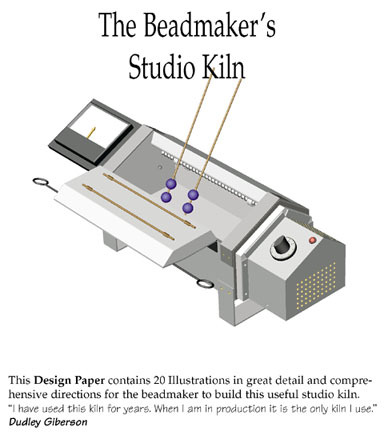 My all time favorite bead annealer: the top loading breadbox shape. This was the first bead annealer I made sometime around 1992. This kiln heats from room temperature to annealing 950 deg. F. in 10 minutes. This was an all analog unit and it held pretty steady using the old infinite switch technique and the analog pyrometer. If I ran it today I would definitely use a controlling pyrometer. We would sometimes load this kiln with 30 to 50 mandrels of glass beads. The hot ones would first go on one side then after they cooled down to kiln temperature we would stack them all together. We would keep the temperature at a modest heat, like 930 deg. F. during the work day, then anneal the whole bunch. It was a great production unit. There are plans for making this kiln in the Construction Papers section. An On-Line Project called "Instructables"
Recently, in the last few months, I have received requests for an on-line project called "Instructables." A fellow there has posted a kiln made for a few dollars which is something like 4.5 inches by 4 inches by 6 inches deep = 108 cubic inches. It is made of soft brick with a grooved element path of 29 inches. He recommends installing a pretty hefty element and lists me as a supplier of this element unit. I have constructed these pages in response to this online "Instructables" project.